I love doing crafts, especially around the holidays. They’re just extra special, plus you can do decor or gifts and consider it a check off your list of to-dos anyway! 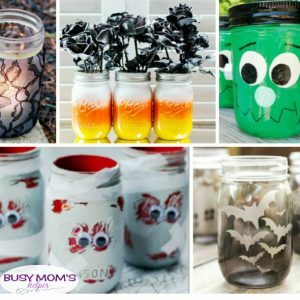 For some extra fun, here’s a list of 20 DIY Halloween Mason Jars – you can pick from spiders or monsters, bats or candy corn, even cute ‘BOO’ jars for some festive decor! My personal favorites are the mummy jars because they’re so dang cute! My kids would have a fun time with several of these, including the ghost lanterns. There’s a little something for everyone, so pick your favorite and get your Halloween craft on with these fun Halloween Mason Jars! 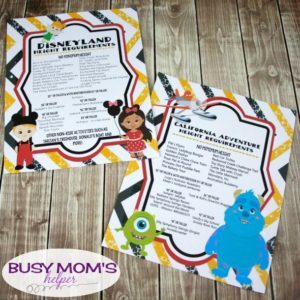 As we get ready for our Disney trips, we have fun with our DIY Disney Countdown, as well as prepare our kids for what rides they can or can’t go on due to any height restrictions. I think that by being prepared, we can help avoid more meltdowns at the parks, making it the best Disney vacation ever! On these printables, you’ll find some favorite characters from each of the parks – like Mike & Sulley for the California Adventure sheet! I couldn’t resist also including Dusty, since he’s one of my boys’ absolute FAVS! Check out Get Away Today to book your trip today! 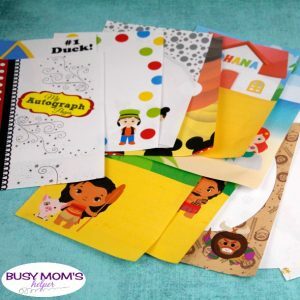 Use Promo Code: BusyMomsHelper to save $10 off your package! I tried to make this as convenient as possible, with the MANY rides that don’t have any height requirement at all listed right at the top. You can pair this with our amazing ‘Unofficial’ Disney Activity Book, but even alone it’s still the perfect printable to fold into your pocket or fanny pack to use for quick reference at the parks. You can download and print off your FREE printables here…. Don’t forget to save some money (every few dollars saved is another Dole Whip – woot woot!) and book your magical vacation -whether it’s Disneyland, Walt Disney World, or even Legoland or Universal Studios – through the awesome folks at Get Away Today! Use Promo Code: BusyMomsHelper to save $10 on your package! Check out the fun changes to Pixar Pier (formerly Paradise Pier) like the Incredicoaster! And did you know – ur ‘Unofficial’ Disney Activity Book is available as a PDF download OR you can nab a printed one from Amazon! Woot woot! Y’all know how much our family loves Disney, right? Well, putting together a fun Disney craft for kids was a great way to celebrate the opening of the new Toy Story Land at Walt Disney World. In anticipation of our visit there later this year, we made this Toy Story Alien Craft – a great activity for a lazy afternoon! Aren’t they cute? We’re all excited to check out the new Toy Story Land during our trip – the Alien ride looks really fun, but we’re especially eager to try out Slinky Dog Dash! 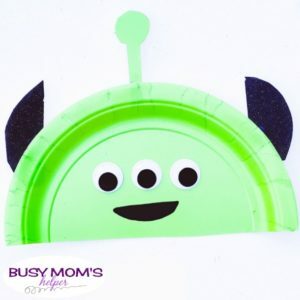 I’m sure y’all know how patient kids are when leading up to a vacation (note the sarcasm there), so why not give them a little Disney creating while they wait with this awesome Alien craft? Take your green paper plate and cut it in half with your scissors. You will instantly have an Alien shaped head. Grab that glue stick and glue three eyes onto each Alien. Now take another green paper plate and draw/cut out an Alien antenna. When you have two Alien antennas, take your glue stick and glue an antenna onto each Alien. Now for the fun part! Take your black marker and draw a mouth on each Alien. I suggest practicing on a blank piece of paper to perfect your technique before drawing on your plate. Enjoy your two fun new Alien friends! Told you it was super easy – and it’s likely that you have at least some of the supplies on hand already. Maybe not BIG googly eyes or green paper plates, but you can easily buy or order those. Then you’re all set for some Toy Story Alien crafting. It feels like we just moved into this house yesterday, while at the same time feeling like we’ve been here years. In all reality, it’s been about 2.5 months – and I haven’t done a single bit of decorating! In all fairness, I still have plenty of boxes to unpack and the more important items to check off the list first, but it really bothers me having nothing on my walls. I was thrilled to get a project to try out, especially because Decorating with Stencils and being able to paint makes me so happy! My kids know when I pull out my ‘painting clothes’, that I’m ready for some DIY fun. I had so many ideas on what to do with the large 35″x35″ Texas State stencil I got – everything from a collage of photos cut to fit inside, to string art filling up the stencil – but ultimately I decided it’d be a fun addition to this huge BLANK spot on one of my upstairs walls. I mean, check out all this boring wall space…. Yup, it was definitely in need of something. For something a little more unique – and because I received both the outside AND inside pieces to this awesome stencil from Stencil Revolution – I decided to do the state shape itself in black chalkboard paint. 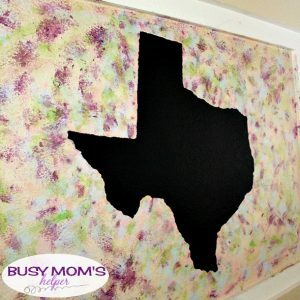 It took three or four coats to get it as smooth and dark as I wanted, but then was a beautiful Texas-shaped chalkboard spot on the wall! I’m sure you could make the smudging work with paint brushes, but I felt that the rags really gave it the random splotches, streaks and swipes that I was going for. At first, I was just going to do it a couple inches out from the black shape, but loved the look so much that I decided to fill that whole indented area on the wall – and I love how it turned out! Soon, I want to add a red heart on top of the Texas shape right where DFW is, since that’s home for us! Since I already had my ‘painting clothes’ and all my supplies out, I tackled another one of the fabulous stencils I got from Stencil Revolution – an awesome quote for the kitchen that reads ‘Today’s Menu: Eat it or Starve’ I know many of you moms are chuckling, just as I did as I browsed the site full of stencils! I feel like dinnertime is a constant battle, so may as well have a bit of humor with it – along with a pop of color in the kitchen, right? There’s not a ton of wall space in my kitchen, which is fine with me because I love all the cabinet space and openness. This 18″x12″ vertical stencil fit perfectly on this column by my island area, and really helped that blank spot that was just begging to be decorated! I’m thrilled to finally have some fun colors in my house, and had so much fun painting! I’m eager to add some more stencil decorations to my walls (I’ve got a beautiful saying to go in my bedroom, and a fun Iron Man face that the boys will enjoy in the game room or their bedroom), so stay tuned for more DIY projects and colorful fun! What stencil would YOU want for your home? 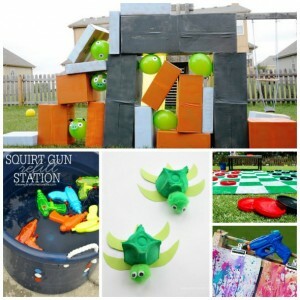 My kids love taking paper and creating things with them – from ‘houses’, to figurines, fun shapes and more. The great thing about it is that you can mix up the colors and sizes to really create a ton of possibilities. This fun DIY Paper Leaf Craft for Kids is perfect, and they can use it to decorate, play, or just for working those fine motor skills! 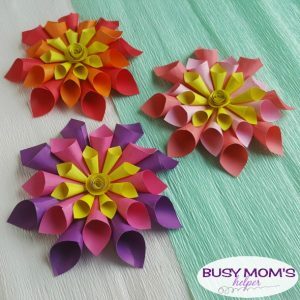 We did something slightly similar when we shared a DIY Paper Flower craft, and this is just as easy to follow and flexible. You can even try it with some cool textured paper to really make the leaves unique! You only need a few quick supplies, then you’re all set to start your own paper leaf project. Select a colored craft paper and cut it into a square. Fold the paper into half to mark the mid line. Unfold the half fold again. Fold the paper from any one side to meet the mid line. Fold the other side to meet the mid line as well. Again, fold the paper into half lengthwise. Create a small diagonal fold at any one open end corner. Start making small and even folds diagonally by keeping the folds aligned with the first diagonal fold. Try keeping the folds even. Continue to create small diagonal folds until reaching the other end of the paper. Unfold the last lengthwise fold made in step 3. Squeeze and twist the bottom end of the folded paper to create the stem of the leaf. Apply glue to secure the twist. Now apply glue along the top widest fold of the folded paper. After applying the glue join the widest top folds to form the basic leaf shape. There will be a small part of the top folds pointing outwards at the backside of the leaf, use scissors to cut off that extra part. Don’t be intimidated by so many steps – they’re each very simple and quick, we just spread them out to make it even easier to follow! I’m thinking to make a bunch of these are around fall, as well, then having the kids create ‘trees’ using fallen branches. So fun! 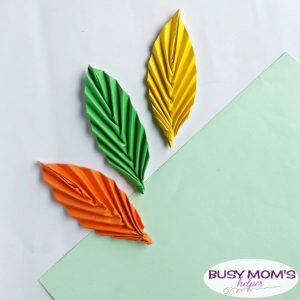 What could you use a colorful paper leaf for? Please tell me I’m not the only one who has a huge stockpile of popsicle sticks (aka craft sticks)? 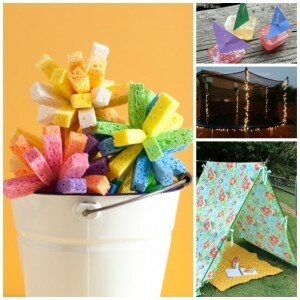 Not like used ones from popsicles my kids have eaten, so don’t worry – but I buy them in bulk because there’s so many awesome projects you can create with them! 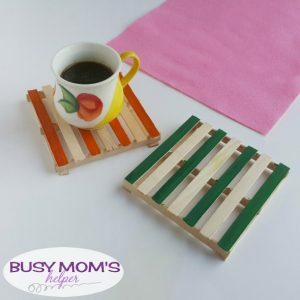 The latest fun are these DIY Popsicle Stick Coasters that you can quickly put together, then decorate however you’d like! 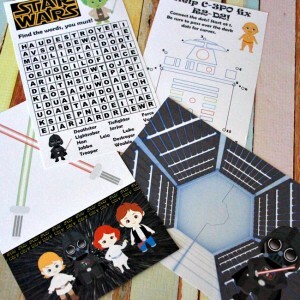 We’ve used craft sticks in plenty of things, such as our DIY Valentine Frame, to hold up our fun printable Star Wars Puppets, or even for the kids’ catapults! Seriously, these are one of those craft items that are great to keep in stock – maybe not the crazy amount I have, but still a bag full or so is perfect. Besides, a bunch of these crafts would be great for not just kids, but adults as well – just like these stick coasters! I used 12 popsicle sticks for each coaster, however select the number of popsicle sticks you want and cut off both round ends with the help of craft pliers so that the popsicle sticks are rectangular. Place a piece of paper on a flat surface and place 1 popsicle stick vertically on it; Place 2 more popsicle sticks parallel to each other; Each of the 2 sticks should be placed horizontally with each ends of the first stick. The 1st stick has been used for measurement. Now take the 1 st popsicle stick (placed vertically) and glue it on its side onto the 2 horizontal sticks. Glue 2 more popsicle sticks on their sides onto the 2 horizontal sticks, keeping even gap between all 3 sticks. The base is now ready. Now take the rest of the popsicle sticks and glue them on the base one by one. 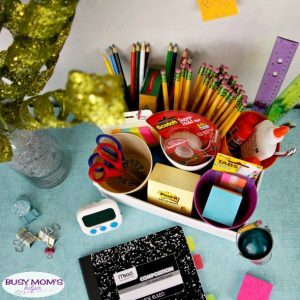 You can either cover the entire top surface or keep small and even gaps between the popsicle sticks while gluing them on the top of the base. Done gluing all the popsicle sticks? Select a color of your choice and simply paint the coaster (popsicle sticks) as you wish. Once you’re done painting, allow the paint to dry entirely. They’re really SUPER easy to make, plus I love how easy it is to paint them to match your own decor or style. How would YOU decorate your craft stick coaster?